As a mechanic in the United States Air Force for the last eight years, Tom Burden knew the frustration of having tools slide off an aircraft as he worked on it. He spent long stretches of time working on a solution in his basement, trying to create a flexible tool tray that would grip tools while resting on the curved surfaces found on aircraft bodies and wings. “I worked on the product to get it into production for three years, pushing to get it to raise capital and get the chemistry right,” said Burden, 26, an F-16 mechanic who joined the service right out of high school. The result of his labor is GrypMat, a rubberized, non-marring, non-slip, anti-static tool tray designed to give mechanics a safe and secure surface to store tools without worrying about damaging an aircraft. “No magnets, just high-end friction,” said Burden. “If it gets gunked up with grease, dust or any dirt, just running it under water using a damp rag will bring it back to life. GrypMat is made out of a polymer-silicone blend and has specific properties to make it resistant to Skydrol hydraulic fluid, JP-8 jet fuel and methyl ethyl ketone (MEK) solvent, said Burden. It’s a product with both rotary- fixed-wing applications and said to go where others don’t, holding tools at angles as high as 70 degrees. “It can go basically anywhere,” said Burden. “It could go on the fuselage, could go on the wing, could go on the windshield if you really wanted it to. 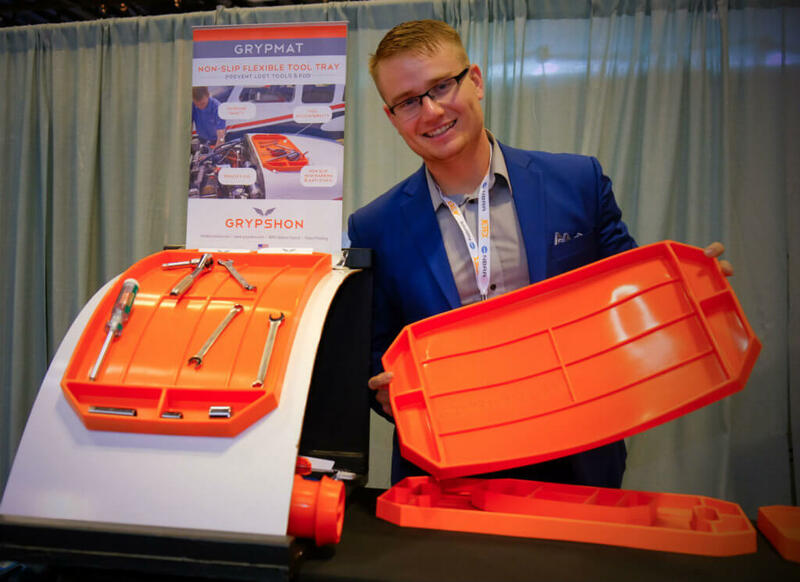 GrypMat launched at the Experimental Aircraft Association (EAA) AirVenture Oshkosh Fly-In and Convention in July 2016 and sold out all of its in-hand product, said Burden. He said the product also received half a dozen distributors at the show, and it had a presence at the National Business Aviation Association Business Aviation Convention and Exhibition (NBAA-BACE) in November. “I didn’t know what was going to happen — if it was going to explode, if everyone was going to hate me,” said Burden. Burden said he had been focused on the internal structures of shipment systems of Grypshon Industries — the company that created GrypMat — as well as taking orders and launching new products. The original GrypMat measures one foot by two feet and will be re-vamped with new handles, a measuring system and better branding, said Burden. At NBAA-BACE, the company also showcased a medium-sized GrypMat that measures 11 inches by eight inches and a small version that measures 11 inches by six inches. He predicted the company would sell three times as many products at NBAA-BACE as it did at Oshkosh. Great Product. We’ve been actually using them for storing tools we use to work on weapons systems. So many applications for this in and out of the aviation industry. Please send me more information concerning cost and availability. Please send me your email or email us at [email protected]. both of my boys are aircraft mechanics, where can I buy this.